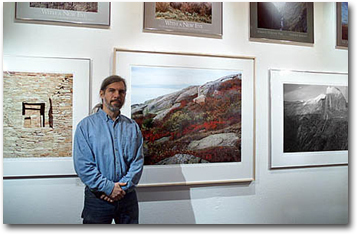 Stephen Johnson in his gallery. Original fine art prints made by Stephen Johnson of his photographs are available directly from the photographer and from various galleries around the country and are most often custom made as ordered. Prints from the current project "With a New Eye: The Digital National Parks Project" are generally made as direct digital prints, either as pigment inkjet prints, or laser-based photographic paper prints. Some vintage prints have been made from film-recorder negatives by traditional enlarging processes. "With a New Eye: The Digital National Parks Project"
Photographs and Text Copyright ©2016, Stephen Johnson. All Rights Reserved Worldwide.